Global Aerospace Corporation (GAC) announced today that, in collaboration with Northrop Grumman Aerospace Systems, it will be developing a new exploration vehicle for Saturn's moon, Titan. Under a 2016 Phase I NASA Small Business Innovation Research (SBIR) contract, the GAC-NGAS team will develop the Titan Winged Aerobot (TWA) concept and produce a proof-of-concept prototype for Earth-based testing. TWA, inspired by Northrop Grumman's Titan Lifting-Entry Atmospheric Flight (T-LEAF) platform, incorporates features such as ultra-low power requirements and extended vertical range. "Titan is a cold, harsh environment that poses many technical challenges for any lighter-than-air exploration platform, but TWA has the potential to overcome these challenges with simple yet innovative engineering approaches to pressure management, lift generation, and maneuverability," said Dr. Benjamin Goldman, principal investigator of the Phase I SBIR effort. TWA is a hybrid entry vehicle, balloon, and maneuverable glider with 3-D directional control that could satisfy many science objectives, while operating on the minimal power available from a single Radioisotope Power Source. Its unique buoyancy system is at the heart of the proposed innovation, enabling both ascending and descending glide without propulsion systems or control surfaces. Roving the atmosphere will facilitate long-lived flight at low altitudes with revisit capability and possible targeted delivery of probes to the surface. Titan is of great interest to the scientific community due to its rich atmospheric chemistry and vast oceans of methane. Despite surface temperatures near -300°F and a lack of water, some scientists have speculated that Titan could support non-water based life that survive in methane, analogous to the waterborne creatures here on Earth. NASA is interested in exploring this exotic world in great detail, and for that purpose, maneuvering vehicles with operational flexibility are needed. 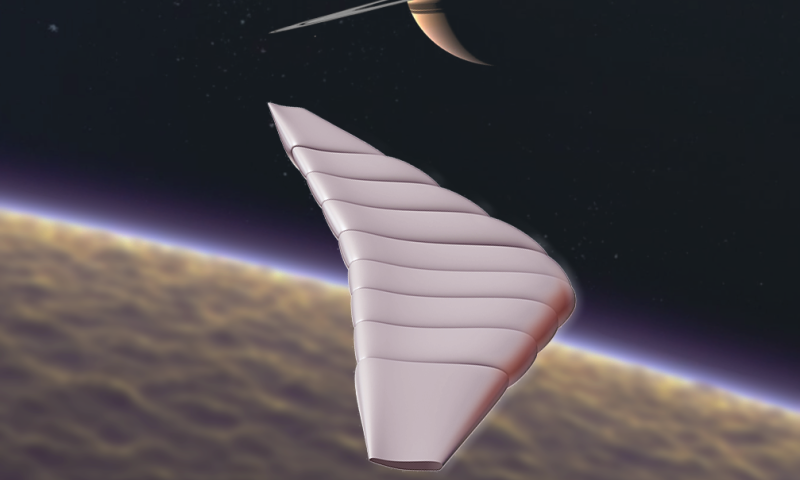 Aerial platforms such as TWA could support many Titan missions including interplay between the surface and atmosphere, prebiotic exploration, astrobiology and habitability studies. Potential TWA science measurements include: high resolution visible and IR imaging to understand the surface geomorphology; subsurface radar sounding to determine nature of the Titan crust; atmospheric circulation along with methane temperature and humidity vs. altitude to understand the transport of volatiles; and the composition of surface hydrocarbon to determine the chemical pathways leading to formation of complex organics. While the proposed effort is focused on developing and tailoring a vehicle for the Titan environment, the technology in TWA and T-LEAF is applicable on any solar system body with an atmosphere. Similar systems could be developed for Mars exploration missions and cargo/payload delivery. These concepts also have many Earth-based applications that are of interest to NASA, including high-altitude atmospheric science and low-g sample or payload return from the International Space Station.